Do you have a problem with kitchen bin overspill? If you’re anything like us at The Barn we have more recycling each week than our kitchen bin could handle. I hated the way we ended up with boxes, milk bottles and other rubbish piled up around the bin looking awful! 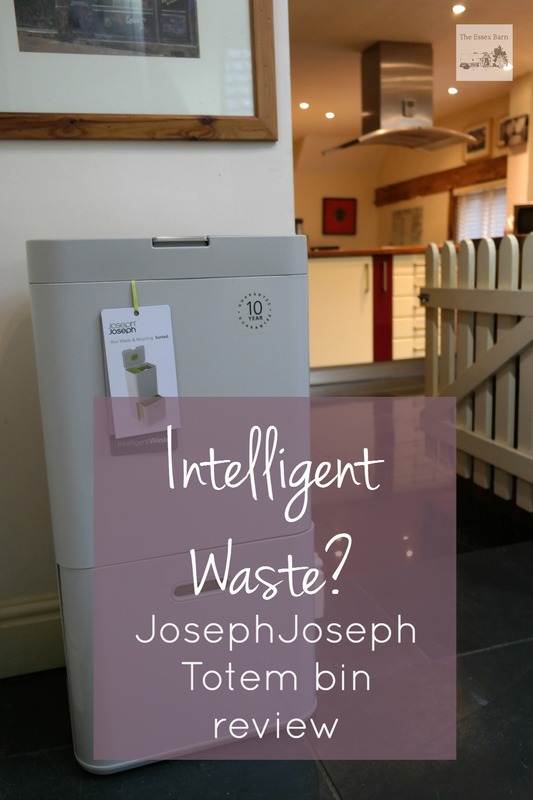 So I was excited when JosephJoseph, one of our favourite luxury kitchen brands, invited us to try out their Intelligent Waste Totem bin to see if it could fix the unsightly rubbish creep. 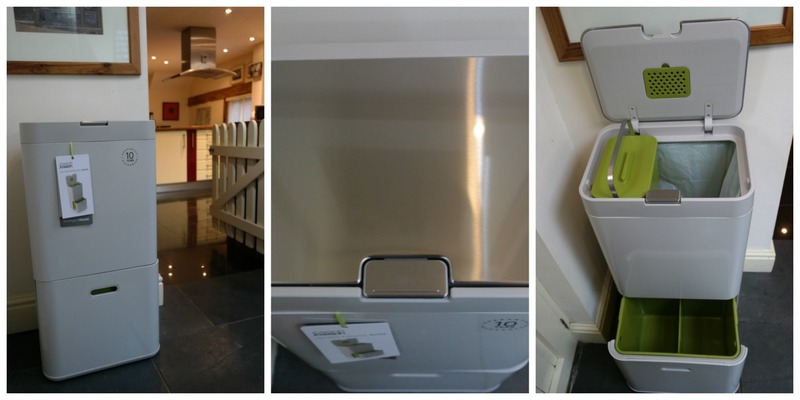 Take a look at our Totem bin review in action! But I’ve been really pleasantly surprised! We’ve been using the Totem for over a month and so far we haven’t had any overspill at all. 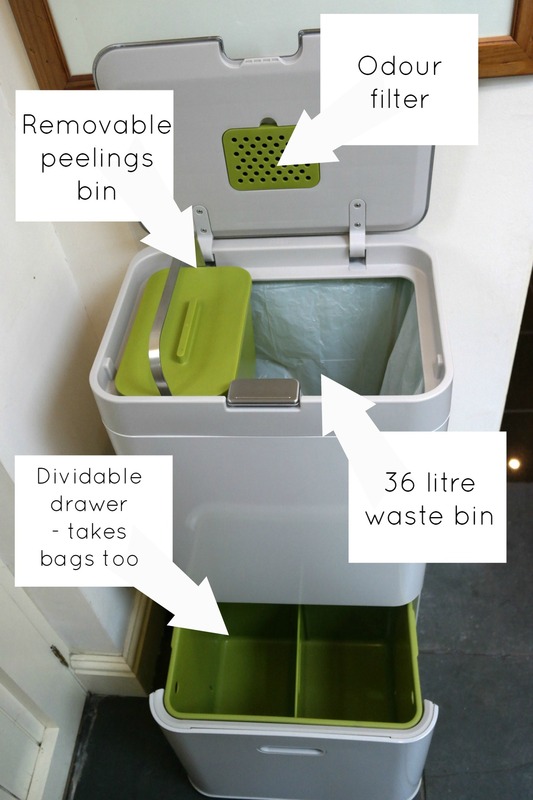 Plus I’m getting lots of lovely comments about our new bin (and how often can you say that?!) 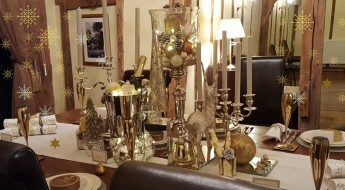 and because the kids love using it (as you can see from the video) it’s encouraged them to help keep the kitchen tidy. The Totem comes in two sizes and we plumped for the larger Totem 60. It came in a huge box with lots of useful extras including bin liners for the main compartment and compostable lines for the removable peelings caddy, plus an air filter. Despite being slimline, the Totem 60 actually holds a lot of rubbish with a 36 litre main bin compartment, 24 litre bottom drawer and 4 litre removable caddy all configurable to meet your needs. We use the whole bin for recycling as we have much more of that than normal waste. The top compartment holds all our small recycling, the caddy is for peelings and I keep the bottom section divided up for larger items like wine and milk bottles, folded up Amazon boxes and paper. The bottom drawer is really useful because it comes out completely and the green section lifts out so I can carry it straight out to our recycle bin. 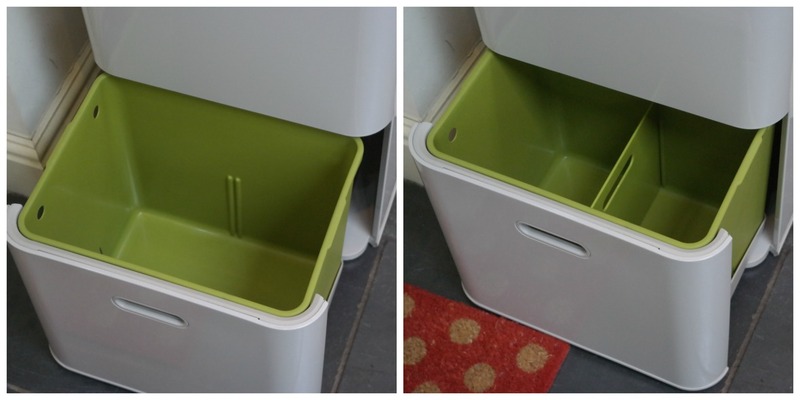 If you remove the divider it becomes another useful bin that you can pop a liner in or you could use it storage if you have less rubbish. The stainless steel touch-open lid is fingerprint proof which is fabulous for my sticky-fingered little ones! One quick wipe is all it needs to look good as new again. The odour filter means no nasty niffs from the main bin compartment (and a filter was included with the bin). The large 36 litre general waste compartment is big enough to take all our smaller recycling and doesn’t need emptying for days. There are custom-fit liners available but normal white bin liners work perfectly too (we can’t use the grey JosephJoseph ones for our recycling). The multipurpose bottom drawer has a lovely easy-glide opening and the drawer is dividable into two sections for sorting larger recycling like bottles, boxes and newspapers or can be used with a liner as an extra bin. There are even clever carrier bag hooks so that you can use them to line the bin! The removable caddy stores in the top of the bin or in the bottom drawer but I leave it on the countertop so I can use it for peelings when I’m preparing food. It has a clever retaining ring that stops your compostable liner coming loose and the lid stores on the site of the bin. The Totem bin has a 10 year guarantee so I have peace of mind that if anything breaks I can get a replacement. Overall I really love the Totem 60. It looks good with a small footprint that doesn’t take up much room and it holds all our recycling. 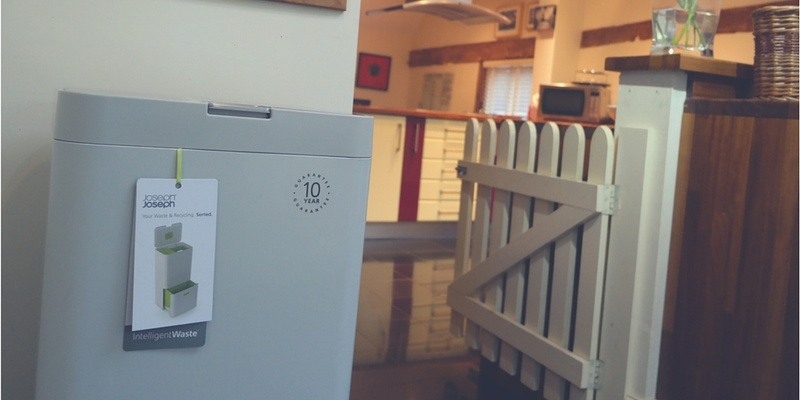 It’s a pleasure to use and despite being quite pricey (prices start at £175) I think it’s cleverly designed and great value – definitely intelligent waste! 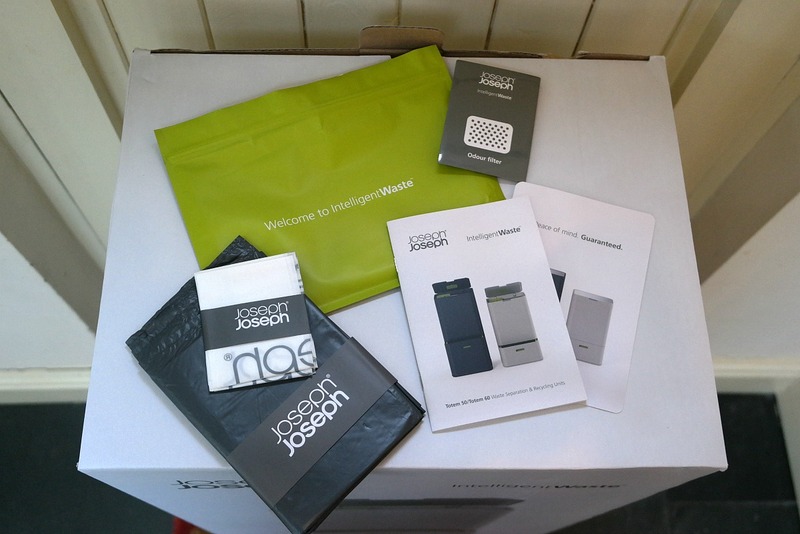 You can see the whole Intelligent Waste range on the JosephJoseph website. Great review! I have been toying with getting one but they are very expensive. But I have seen the price drop to about £120 on amazon. PS try flattening your milk bottles and cereal boxes. Then they won’t take up that much space and you can fit more in the bin! Plus it will help the collections too by not wasing transportation on what is essentially air! we have just bought this bin and I’m currently working out how to remove the odour filter to place an odour filter sheet… however i can’t remove the green plastic part i was just wondering if anyone could tell me how? I am really looking forward buying this waste totem. Only I saw some bad critiques somewhere online, about the quallity. And as I look here, on the pictures, one of those critiques seems to show here too. The drawer, looks croocket. I really wonder what this bin looks like after a month or two. Can anybody tell me? Also about scratches on the lid. Hope to read some positive messages. I really really love the look of this bin!!! 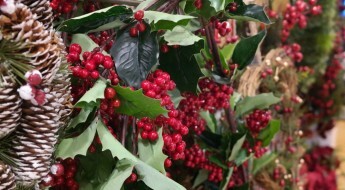 I’ve been looking at these, and really not been convinced. You’ve given a persuasive argument though…hmm I can really see how good they are now! This is the answer to our bin problem! Nice! Thanks for sharing. 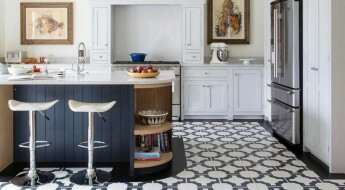 At first I wondered how a post about a bin had anything to do with #sharethejoy but now I get it, a tidy kitchen would certainly bring me lots of joy!!! Ha ha! Well that’s one strategy I suppose! You’re right it is an expensive bin. But you know what? I love using it every day and for a bin that’s in constant use I think it’s actually great value! This is a wonderful product. Thanks for the honest review.